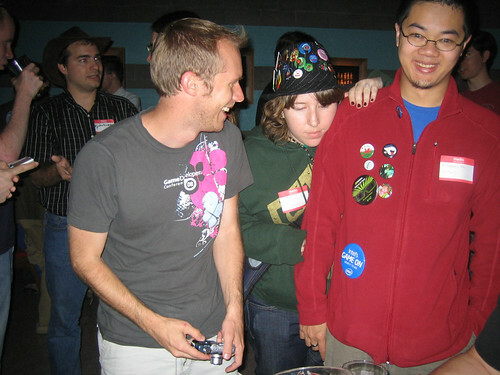 My desire to attend PAX first hatched in the spring of 2004. 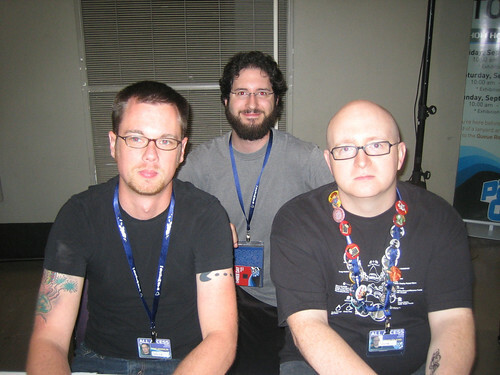 I recall sitting in the bedroom of my first townhouse, having just moved out of the dormitories of our college, and reading about the Jack Thompson controversy and Penny Arcade’s response. Thompson had hypothesized that no game developer would dare make a game where the protagonist went through a game studio, killing everyone he or she found, and if someone did make such a game then Jack Thompson would donate $10,000 to a charity. Of course, a game developer immediately rose to the challenge and created such a game, but Thompson reneged on his offer. “Clearly, they are too stupid to recognize sarcasm,” he lamented. Tycho and Gabe wrote a check to the charity, and in the memo line they wrote, “For Jack Thompson because Jack Thompson won’t.” I decided on that day that I must shake their hand. When I arrived at the con, I decided to head immediately to line up for the Penny Arcade Question & Answer panel so I would have no trouble getting in. They weren’t queuing for it yet, though, and a second Star Wars demo was going on instead, so I decided to attend that with hopes of staying in the main theater for the PA Q&A to follow. The Star Wars (The Old Republic) demo was better than yesterday’s, and the surprise demo of the Trooper class was pretty neat, but mostly I was mollified (and therefore less annoyed than yesterday) by my excitement to meet Gabe and Tycho. Once the Q&A began, I immediately got into line behind a mic. After expressing my undying love (my words were more geared towards, “I respect and admire you two so much, and you’re sort of my mentors, and I’m a writer and want to be just like you OMG”), I asked my question. “You’re both DMs now, so we were wondering if you could help us with this. With Dungeons & Dragons 4th ed., we can finally cast a magic missile at the darkness. But what is the darkness’s HP and defenses?” I asked. I felt pretty good, and they said that getting a picture and a hand shake was absolutely something within their power to do, so I anxiously waited for the rest of the session so I could turn around and line up again to actually meet them. You can see the results above. I shook their hands and told them we had continued discussing the magic missile conundrum and come to a conclusion. As Gabe shook my hand, and shook, and shook, refusing to let go as he wagged my arm back and forth and up and down, I suggested that Jim Darkmagic could probably cast a magic missile dark enough to hit the darkness. Maybe even dark enough to hit the light. “Well, yeah, of course Jim Darkmagic could do it,” Gabe said. Tycho agreed. Their signature disinterested pose is pictured above, but I couldn’t keep my giddyness from my expression. Maybe if I get the chance again, I’ll try to affect the same distance just to be cool like them. Following the con we Twitterers gathered at The Garage for drinks, pool and bowling, and meeting each other in person at long last. I regret my tiredness, but it was good to meet some more people I’d been reading for a while (hallo @samcconnell!) and others I had only seen online a couple of days ago (such as @rockelita). I regret not meeting @johnhummel but I did get to hang with @teacup a bit more and see @frightfully one last time before I leave tomorrow morning for Portland. On the way back to my hotel, I put my PAX earbuds in and listened to Marching Bands of Manhattan. It was appropriate. I depart on an Amtrack train at 9:45 a.m tomorrow… but this might just be the PAX train–a train that a bunch of PAXers take on the first leg of their journey back across the country to their homes. If so, that would be quite awesome.